Non-research animals are restricted on the University of California (UC), Santa Cruz campus (as defined in this policy) in order to provide a safe and healthy environment for members of the campus community to study, work and live; to preserve the flora, fauna, and natural beauty of the campus; to protect research projects being carried out on campus lands; to ensure the protection of the campus Natural Reserve and Habitat Reserve areas; to comply with local, state, and UC animal ordinances and environmental quality standards; and to ensure public safety. This policy provides general provisions and guidelines specific to non-research animals that are not subject to the Service/Support Animals policy DSS-003. Non-research Animal: Any animal, either personally owned or wild, in the possession of, or under the control of, or brought onto university property by any academic, staff, student, or visitor of UC Santa Cruz that is not an approved research animal as defined in this policy. Research Animal: Any animal used in university research, teaching, testing, or experimentation that has been approved by and is overseen by the appropriate university authorities as specified in the IACUC Policies and Guidelines. Professional Working Animal: Any animal serving a specific university purpose that requires specialized training or specific capabilities and is not an Americans with Disabilities Act (ADA) service dog. Small Pet: Smaller non-research animal traditionally kept in a cage, display case, aquarium or other container designed for the purpose of housing birds, fish, reptiles, amphibia, or crustacea. 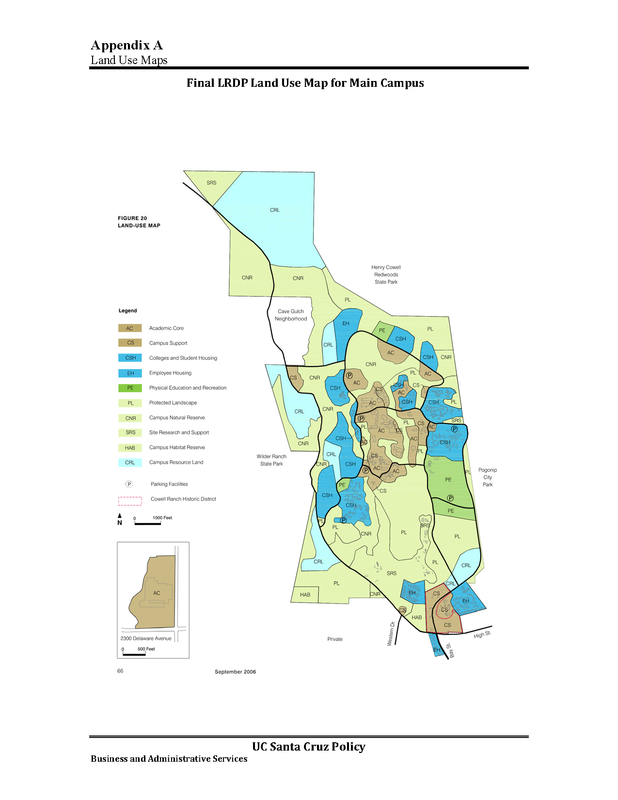 UC Santa Cruz Campus: All land owned, leased or otherwise controlled by UC Santa Cruz (including the Coastal Science Campus) such as buildings, grounds, parking lots, and all developed and undeveloped lands. 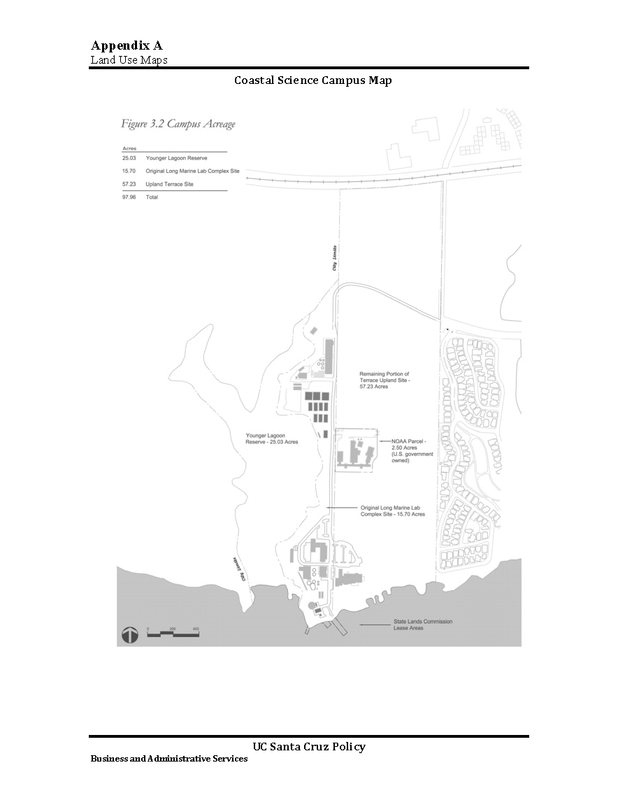 Coastal Science Campus: The 98 acres of UC Santa Cruz-owned property containing the Joseph M. Long Marine Laboratory, including its Seymour Marine Discovery Center, the Younger Lagoon Reserve, the California Department of Fish and Wildlife Marine Wildlife Facility, and other undeveloped lands. The National Oceanic and Atmospheric Administration (NOAA) Southwest Fisheries Science Center laboratory is a 2.5-acre federal inholding on the Coastal Science Campus (see map in Appendix A).inholding on the Coastal Science Campus (see map in Appendix A).inholding on the Coastal Science Campus (see map in Appendix A).inholding on the Coastal Science Campus (see map in Appendix A). Inholding: A parcel of land not owned by the Regents of the University of California, which is surrounded completely by land owned by the Regents of the University of California. Natural Reserve: A portion of the UC Santa Cruz campus within the UC Natural Reserve System, which is a network of protected natural areas throughout California established to provide undisturbed environments for research, education, and public service. Habitat Reserve: Portion of the UC Santa Cruz campus retained as high quality grassland and forest habitat for the California red-legged frog and the Ohlone tiger beetle (see map in Appendix A). Service Animal: Any dog that is individually trained to do work or perform tasks for the benefit of an individual with a disability, including a physical, sensory, psychiatric, intellectual, or other mental disability. Other species of animals, whether wild or domestic, trained or untrained, are not service animals for the purposes of this definition, unless otherwise provided by law. The work or tasks performed by a service animal must be directly related to the individual's disability. Examples of work or tasks include, but are not limited to, assisting individuals who are blind or have low vision with navigation and other tasks, alerting individuals who are deaf or hard of hearing to the presence of people or sounds, providing non-violent protection or rescue work, pulling a wheelchair, assisting an individual during a seizure, alerting individuals to the presence of allergens, retrieving items such as medicine or the telephone, providing physical support and assistance with balance and stability to individuals with mobility disabilities, and helping persons with psychiatric and neurological disabilities by preventing or interrupting impulsive or destructive behaviors. Support Animal: Animals that individuals with disabilities utilize for emotional support, well-being, or comfort. Because they are not individually trained to perform work or tasks, support animals are not service animals. Therapy Animal: Any dog that has been trained and certified to reliably provide affection and comfort to individuals or groups of people in stressful situations. A therapy dog’s primary job is to allow unfamiliar people to make physical contact with that dog and to respond positively to that contact. Therapy dogs and their handlers participate in dog-assisted activities/therapy in a variety of settings with people who may or may not have a disability. A therapy dog is usually the personal pet of the person handling the dog at the event. Therapy dogs are not service animals or support animals and are not exempt from pet-restricted housing rules. Animal Posing a Threat: An animal whose behavior is perceived as threatening the safety of other people or animals. Threatening behaviors include but are not limited to baring teeth with ears back, growling, snapping, biting or nipping, scratching, jumping up and knocking a person off balance or down, and chasing people or other animals. Animal Creating a Nuisance: An animal that is creating a nuisance is repeatedly exhibiting behavior that is disturbing, detrimental to, or interfering with the activities of people in the vicinity. Nuisance behaviors include but are not limited to frequent barking other noises, being at large (off leash) in the community, especially in other campus residents’ yards, or damaging private property through digging, chewing, etc. Animal Posing a Health Risk: An animal that is incontinent or not housebroken, flea infested or has other transmittable parasites. 1. Non-research animals, including dogs, cats and other personally-owned animals are prohibited on the UC Santa Cruz campus (as defined in Section II Definitions above) unless specifically exempted. 2. In situations where an animal is exempted in accordance with applicable laws and UC Santa Cruz policy and procedures, UC Santa Cruz reserves the right to rescind the exemption if the animal is perceived to be posing a threat or health risk, or creating a nuisance. 3. All exemptions for service or support animals will be handled in accordance with the Service/Support Animals policy DSS-0003. Service/Support Animals: See the Service/Support Animals policy and procedures DSS-0003. Therapy Animals: See Therapy Animal Event policy and procedures BAS-0003. Professional Working Animals: See section II.B.3 of the Non-research Animals procedures BAS-0002. Animals in University Housing: See section II.B.4 of the Non-research Animals procedures BAS-0002. Livestock: See section II.B.5 of the Non-research Animals procedures BAS-0002. Horses: See section II.B.6 of the Non-research Animals procedures BAS-0002. Please refer to the Non-research Animal procedures BAS-0002 for more information. If you need help with a Service or Support animal, see the Service/Support Animals policy DSS-0003. This policy applies to all academics, staff, contractors, students, and visitors on the UC Santa Cruz campus. The Service/Support Animal policy DSS-0003 further clarifies but does not supersede the Non-research Animal Policy BAS-0002 as it pertains to service and support animals for individuals with disabilities. This policy supersedes UC Santa Cruz Policy SPS0005: UC Santa Cruz Non-Research Animals on Campus, dated 6/10/1997. The Vice Chancellor of Business and Administrative Services is the campus authority for the UC Santa Cruz Non-Research Animal policy, with implementation authority delegated to the Associate Vice Chancellor of Risk and Safety Services. This policy was reviewed and approved by Campus Provost/Executive Vice Chancellor Galloway on 07/24/2015. This policy will be reviewed every five years. April 10, 2019: Minor technical revisions and alignment of definitions and removal criteria with the Service/Support Animals DSS-0003 and Therapy Animal Event DSS-0002 policies. August 8, 2017: Minor technical revisions, clarification to appeals and grievance procedures, and removed requirement for a distemper vaccination. These procedures address non-research animals on the University of California (UC) Santa Cruz campus and include requirements for exempted animals, types of animals that are exempted and procedures for obtaining exemptions, procedures for submitting complaints/reporting violations, relevant authorities and contacts for assistance and enforcement, and consequences for policy violation. For a list of definitions and how to get help, refer to the UC Santa Cruz Non-research Animal Policy BAS-0002. Dogs and cats must be vaccinated against rabies prior to first arrival on campus. Both dogs and cats must wear a collar with an identification tag bearing the owner’s name, address and either home or work phone number. Support cats that do not tolerate a collar may be micro-chipped (see Service/Support Animals policy and Procedures DSS-0003). Pets found without proper identification may be considered strays and taken to a local animal shelter. Dogs and cats must by spayed or neutered, unless the Santa Cruz County Animal Shelter, SPCA or a veterinarian has issued an unaltered animal certificate. Dogs must be currently licensed and must display the tag issued by the licensing agency. Cats must wear a safety-approved collar with a bell whenever they are outside. Dogs must be on a leash and under the supervision and control of their owner at all times when in public spaces. If an animal exhibits unacceptable, aggressive, or disturbing behavior, the owner must take immediate effective action to correct the situation. It is the responsibility of the animal’s owner to properly dispose of any solid waste including cat litter and cage cleanings. The waste must be disposed of in a sealed bag in an outdoor trash container. All policies and procedures related to service and support animals can be found in the Service/Support Animals policy and procedures DSS-0003. Registered therapy dogs may be permitted on campus as a part of an approved therapy animal event. See the UC Santa Cruz Therapy Animal Policy and Procedures BAS-003 for details. Professional working animals that are on campus to perform university mission-critical work consistent with health and safety may be exempted. All working animals must be under the control of their handler (or confined if herd animals) and performing the work for which the animal was engaged. Examples of exempted professional working animals are search and rescue dogs, police dogs, detection dogs, cadaver dogs, and brush control goats. Individuals wishing to bring professional working animals to campus must get approval from the AVC of Risk and Safety Services prior to bringing the animals to campus. Approval will be based upon a balanced assessment of stakeholder interest and protection of the campus environment. No pets (except fish in a 10-gallon or smaller aquarium) are allowed in the residential communities. This prohibition applies to the resident and to any visitor regardless of the length of visit. The resident is liable for any damage caused by pets or containers holding pets. Dogs and cats are allowed. Dogs may be exercised or walked within respective employee housing areas only and must be on leash at all times. Any feces deposited by animals must be collected immediately. Individuals wanting to keep other small household pets should contact their Employee Housing Manager to find out what is permitted in the leasehold agreement. Cardiff Terrace/Hagar Court/Ranch View Terrace and owner-occupied residences at Laureate Court: Dogs and cats are allowed. Dogs may be exercised or walked in respective employee housing Common Areas and must be on leash at all times. Any feces deposited by animals must be collected immediately. Individuals wanting to keep other small household pets should contact the Employee Housing Manager to find out what is permitted in the leasehold agreement. Individuals wanting to keep small pets should contact the Employee Housing Manager to find out what is permitted in the leasehold agreement. Cattle or other livestock are only permitted on campus as per lease agreements entered into by the university. Horses are allowed on specified trails only (see map). Horses shall not be left unattended or tethered. In the interest of the health and safety of our campus community, UC Santa Cruz strongly encourages anyone who perceives an animal on campus to be a threat, health risk, or nuisance or to violate the policy in any other way to report this to the appropriate campus authorities. If the animal appears to pose an imminent threat to personal safety, such as biting or causing panic/major disruption, call 911. In the event of a bite, the police may also need to contact Santa Cruz County Animal Control. For non-urgent policy violations, please contact the Associate Vice Chancellor of Risk and Safety Services. Complaints should be made as soon as possible after an incident and should include any available photos/videos or other supporting evidence. If the complaint pertains to a service animal, it will be handled in accordance with the Service and Support Animals policy and procedures DSS-0003. Issues regarding animals in student housing will also be reviewed by the office of Colleges, Housing, and Educational Services (CHES), reserving the Associate Vice Chancellor CHES for final ruling on housing-related requests. Depending on the nature of the violation/complaint, additional offices may be involved in the investigation. If an animal is determined to pose a threat or health risk, or be a nuisance, the appropriate campus officials will notify the animal’s owner of corrective action that must be taken or that the animal must be removed from campus and may be permanently banned. Campus officials will also engage the appropriate offices if disciplinary or legal action is required (as specified in section E below). There is no designated appeal process specific to the university's decision to restrict, remove or ban an exempted animal from campus. However, if an employee believes the decision to remove an exempted animal violates university policy, the employee may file a complaint with the appropriate university office. All reports are confidential to the extent permitted by law and university policy. The Associate Vice Chancellor, Risk and Safety Services is designated responsibility for non-service/support animal-related exemptions outside of university-managed housing. The Associate Vice Chancellor CHES is designated responsibility for exemptions in all university-managed housing. The primary responsibility for coordinating the enforcement of the campus non-research animal policy lies with the Associate Vice Chancellor of Risk and Safety Services. Policy enforcement lies with the campus officials including managers and supervisors directly responsible for the affected areas. The UC Santa Cruz Police Department may also enforce the policy as appropriate. Resident students in violation of this policy may lose housing privileges and be subject to student disciplinary procedures. Non-resident students will be subject to student disciplinary procedures. Faculty and staff in employee-owned residences will be subject to local ordinances as well as any relevant leasehold agreements or governing documents such as Declarations of Covenants, Conditions and Restrictions (CC&Rs) or community rules. University employees, staff and academics may be subject to administrative disciplinary procedures. Violators of this policy may be held criminally liable pursuant to applicable California Penal Code, Health and Safety Code, the California Code of Regulations, and the University of California Code. Creating a Nuisance: If the animal is repeatedly exhibiting behavior that is disturbing to, detrimental to, or interfering with the activities of people in the vicinity. Nuisance behaviors include but are not limited to frequent barking or other noises, being at large (off leash) in the community, especially in other campus residents’ yards, or damaging private property through digging, chewing, etc. Posing a Health Risk: If the animal is incontinent or not housebroken, is flea infested or has other transmittable parasites. Posing a Threat: If the animal’s behavior is perceived as threatening the safety of other people or animals. Threatening behaviors include but are not limited to baring teeth with ears back, growling, snapping, biting, or nipping, scratching, jumping up and knocking a person off balance or down, and chasing people or other animals. Although animals will sometimes become ill unexpectedly, the university recommends that animals that are sick should not be brought into university facilities. Conflicts regarding exempted animals and individuals with severe allergies, phobias, etc. will be addressed on a case-by-case basis (e.g., relocation to another university housing facility or an alternate office location). Removal of exempted service/support animals is in accordance with the Service/Support Animals policy and procedures DSS-0003. August 8, 2017: Revised Section A – Requirements for Exempted Animals, revised Section C – Submitting a Complaint/Reporting a Violation, and other minor editorial changes.